Lay your necklace along the collar of your dress to measure the needed length for this piece. Then cut your necklace according to this length plus about the lenght of five or six pearls. Remove these extrapearls and fixate your new string of pearls by making a double knot on every side. 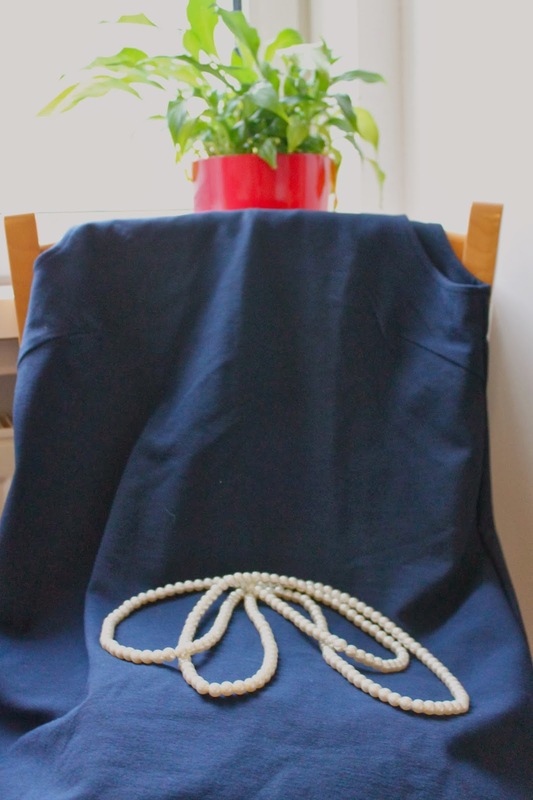 Create a new short necklace (I counted 56 pearls) by knotting the ends of another string of pearls together. Out of this necklace form the upper part of the bow. A third string of pearls will serve as bottom part of the bow. Before you sew the pearls onto your dress fixate the knots with a little bit of transparent nail polish and cut off the loose ends. Handstitch the strings of pearls onto the dress by sewing between the pearls. For the bow it's enough to fix the upper row of the pearl necklace (about 20 pearls) as well as the pearls in the middle of the row below. I didn't fixate all the pearls of the "open triangle" underneath either but only the first four or five pearls on every side.